Neil Gaiman and P. Craig Russell venture into the world of myth and angels in this new edition of their noir-fantasy tale. Constructing and maintaining all of heaven and earth is an immense task, which God has divided up amongst the various ranks and stations of angels. As with any huge effort, there are bound to be casualties. Lights is shed on the lords behind creation as one lonely man in Los Angeles hears the story of one particular unspeakable crime: a murder in Paradise. Murder Mysteries is a haunting frame story. The story begins with the story of a man who is spending a night in Los Angeles on a layover on his way home. While wandering around town, he runs into a man who offers to tell him a story in exchange for a cigarette. The man tells him a story of the first murder in heaven. 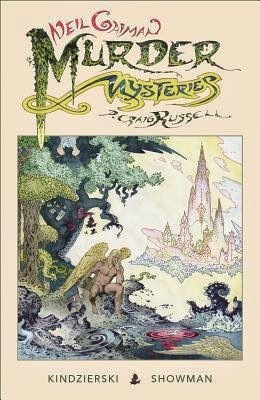 I read the graphic novel version of Gaiman's short story Murder Mysteries, but I have not read the short story, so I cannot speak to any different between the two. There was one small part where the story felt a bit vague, but I feel it was supposed to be that way on purpose. Perhaps in the short story, the detail was a bit more obvious. Besides this one issue, I thought that the story worked well as a graphic novel. The story felt complete. I really enjoyed this dark, adult-themed, fantasy story by Gaiman. The story was quite intriguing, and I was immediately drawn into it. The murder mystery was well written and well-thought out. Lucifer is a character in this story, but he isn't the stereotypical villain that you would assume him to be. At first, I found the frame story to be a bit silly, but in the end it all links up. At the same time, I think I would have been okay with just having the mystery in Heaven and had been done with it. Normally, I have internal conflict about angels being portrayed as anything but good; however, this was not a problem for me in this story. I think it is because this story happens before the fall of Lucifer. I am okay with angels doing horrible acts like murder back in the day than a modern day story. I know that this might sound odd, but it is a quirk that I have. After the story, there was a lot of information about the story and the making the graphic novel. I love when graphic novels have this extra information. Heck, I love when books have this information too. I find it really neat to see how the writing process went for books that I am reading. I found the artwork to be quite good and that it worked well with the story. My one complaint was that all of the angels were portrayed as men (with Ken bodies, if you get my meaning). I would have preferred the angels to have been portrayed as either more androgynous or have female-looking angels as well. I think having all male-looking angels detracted from the story, because the only women were secondary characters.